PTFE stands for PolyTetraFluoroEthylene; it is a fluorocarbon-based polymer. 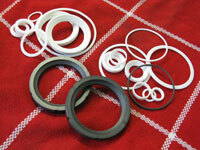 We only use DuPont material for all our PTFE Requirements. PTFE’s mechanical properties are low compared to other plastics, and can be used over a wide temperature range of -73°C to 204°C. Mechanical properties are often enhanced by adding fillers. Generally, filled PTFE’s maintain their excellent chemical and high temperature characteristics, while fillers improve mechanical strength, stability, and wear resistance. It has excellent thermal and electrical insulation properties and a low coefficient of friction. PTFE is very dense and cannot be processed by melting. 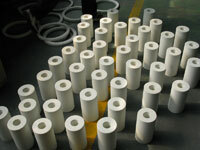 PTFE must be compressed and sintered to form useful shapes. PTFE is easily machined on all standard equipment, including the most advanced CNC machining equipment. PTFE can be cut, bored, milled and turned using standard tooling. While closer tolerances are occasionally required, they usually are not necessary. PTFE is very resilient which allows machined parts to conform to most working dimensions. When closer tolerances are required, it is essential to use stress-relieved products. CIP offers complete annealing services to industry standards for all stock shapes we manufacture. CIP has a complete machine shop to turn out finished parts from prototypes up to production quantities. CIP has been fabricating and machining PTFE for over 20 years. 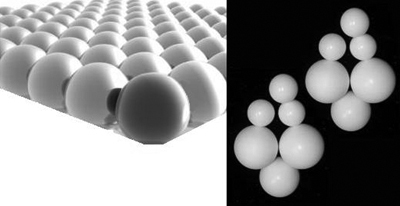 PTFE balls are highly functional in self lubricating conditions such as ball bearings. In the fluid handling industry PTFE balls are used in ball valves that have contact with extremely corrosive liquids. The PTFE ball has reduced maintenance costs and man hours in the field by eliminating the replacement of valve components subjected to corrosive environments. Available Sizes: 3mm – 150mm Dia.